So today I went into full panic mode. We have kennel trained all three of our dogs. Only one stays in a kennel now. He's a 1-year-old Boxer. I know some people don't like using kennels. But it's our way of making sure the puppy doesn't destroy the house. Our dogs are part of the family, but I don't want to come home to a disaster. I was sure I had put Roscoe in his kennel, but at work I started doubting myself. I thought, what if he knocked the Christmas tree over. What if he tore up all the presents. What if he ate the couch. Or the coffee table. I imagined coming home to a terrible situation. But my daughter went by the house before work and everything was okay. Thank goodness. Last night I made a really good dish. It's a quick stir fry dish called Shaking Beef. It's a Korean dish. The real name is Bo Luc Lac which means "shaking beef." You're supposed to shake the skillet back and forth while cooking it. I didn't shake it, and it was just fine. But my husband, son, and I thought this dish was fantastic! 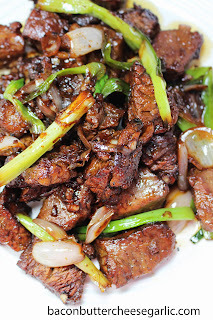 It's a quick dish with a really good marinade and tender beef and shallots and green onions. I meant to take the small amount leftover to work today, but I forgot it. And then my son found it after school. It's all gone. I guess if you snooze you lose. This is a dish that I will definitely be making again and again. Enjoy! Whisk the marinade ingredients together. Add in the beef and stir to coat. Put it in the fridge and let it marinade for at least 1 hour. Heat a large skillet to high heat and add in the butter and vegetable or olive oil. Remove the beef from the marinade and save the marinade. Add the beef to the skillet and brown on all sides, about 1 minute per side. Add the onions, garlic and shallots and cook about 1-2 minutes to soften them. While the meat is cooking, put the marinade into a small pot. Bring it to a boil and continue boiling until it's thick and bubbly. Pour the cooked marinade over the beef and veggies and serve.